Let us praise holy Barbara who has broken the snares of the enemy./ By the help of the weapon of the Cross/ she has escaped as a bird and flown Godwards. 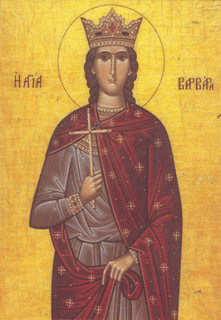 Great Martyr Barbara, thou didst follow Him Who is praised in Trinity,/ having abandoned the idols' shrines./ Thou didst strive in the midst of the arena, not shrinking from the tyrants' threats./ Thou didst cry out in a strong voice:/ I worship the Trinity, the One Divinity. Let us praise the illustrious hymnographer John,/ teacher of the Church and champion against her enemies./ For armed with the weapon of the Lord's Cross,/ he has banished the errors of heresy./ He fervently intercedes with God Who grants forgiveness to all.